The City of Cupertino on Monday published the complete video of a planning commission session that took place in early October, including a rarely seen clip Apple used to introduce the Campus 2 project. Near the start of the video, Apple's real estate and facilities chief Dan Whisenhunt introduces the short three-and-half-minute clip created to promote the Campus 2 project to the City of Cupertino's planning commission and, ultimately, the city council. As noted by CNET, the video was shown to the public at this month's planning commission meeting, as well as the recent Cupertino City Council vote that granted Apple final approval of the project. Set over a bed of uplifting music, architect Norman Foster, along with other project team members, discuss the beginnings and future implications of Apple's huge undertaking. The clip feels like promo material crafted for Apple's product keynotes, with a heavy emphasis on sustainability, usability and quality craftsmanship. Interestingly, Foster notes that the now-famous circular "spaceship" structure wasn't in the original plans. "It didn't start as a circular building, it really grew into that," Foster said. "So the idea of one building with a great park was really borne out of a very intensive process." Foster goes on to say he was contacted "out of the blue" in 2009 by late Apple cofounder Steve Jobs, who asked for help with the project. According to Foster, Jobs requested he be thought of as part of the team rather than a client. He still thought of California as "the fruit bowl of America," and wanted Campus 2 to reflect the landscapes he remembered as a child, Foster recalls. A large part of Apple's plan, according to Apple's senior arborist David Muffly, is to bring California back to Cupertino. The former HP campus on which Apple's Campus 2 is being built was covered in buildings, concrete parking lots and non-indigenous decorative trees ill-suited to the specific Pacific climate. The strongest of the trees will be replanted and augmented with sturdy species that will flourish to create large open expanses of greenery. 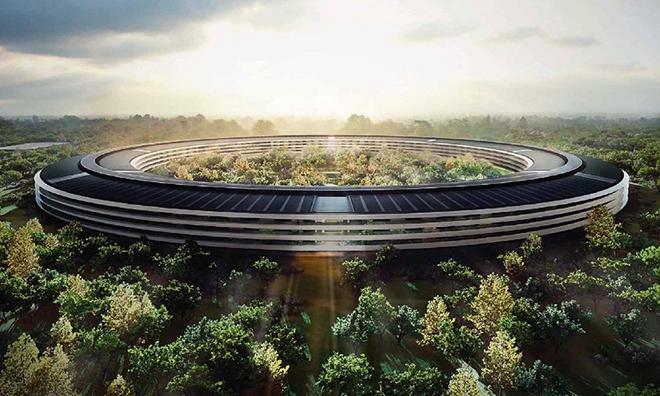 Apple VP of Environmental Initiatives Lisa Jackson reiterates that 80 percent of the site will be so-called "green space," while the main building will go without air conditioning or heating for 75 percent of the year thanks to natural ventilation. Further, 100 percent of the campus' energy will be sourced from renewable assets like solar power and bio fuels. Finally, the design of itself is detailed, with Foster + Partners architect Stefan Behling saying nearly every aspect of the structure is pushing the boundaries of current technology. From the facade to the unique concrete structure, "everything is handcrafted for this project." Previously, attention focused on the huge monolithic curved glass panels that wrap around the main building, but Behling notes even the planned glazing techniques have never been used before. The layout of the mothership is also forward thinking, with a design plan that fosters collaboration between employees. Interspersed throughout the clip, snippets from Jobs' original 2011 Campus 2 pitch to the Cupertino City Council in 2011 are dubbed in. Also seen in one of the shots is SVP of Design Jony Ive. The video culminates in a swell of music as the camera pans over a model of the Campus 2 site. "Apple's always been in Cupertino," Jobs says, "and we're proud to be here."